snowdeal.org > ex machina: frozen peas are the bestest? 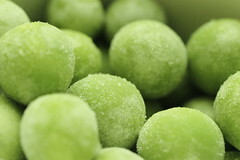 frozen peas are the bestest? i can't remember how it started, but somewhere along the way, odin decided that frozen peas were one of the bestest foods ever and he's been known to a whole day's worth of vegetables in one sitting. you don't have to look to far on teh internets to find that it's not uncommon for toddlers to love frozen veggies in general and peas in particular. i wonder why it is that i don't think i've ever seen an adult voluntarily eat a frozen vegetable. certainly, they're healthier than the boiled veggies many of us grew up eating but still, i don't see myself switching from steamed anytime soon. if you're older than 2, it's time to fess up if you have a taste for frozen ( meaning, you never cook them ) veggies. Longtime Lurker - I'm 25 and the only way i'll eat peas is if they're frozen. Doesn't apply to other vegetables, though. Piper and Aidan LOVE frozen peas, it's the only way they will eat them too! Hope you're having a great start to 2007! Miss you guys. Another lurker who loves frozen peas. And I'm 30. OHO! I win the prize for being the oldest! At 84 next week confess to eating a sample of ANY froz veg I'm cooking!